Well, here I am, behind the eight ball again... We had a freeze last W/E so apples need to be processed... 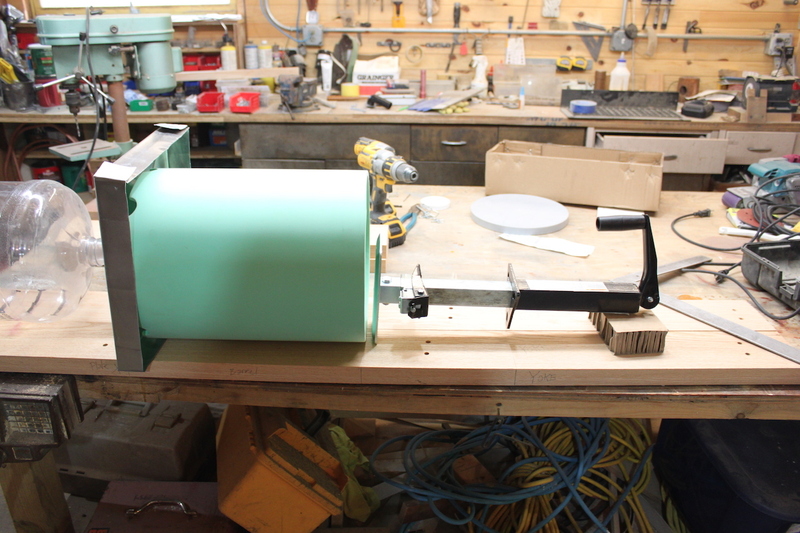 I made the grinder with a garbage disposal unit... thats easy.. Now for the press... My wheels are spinning... I think perhaps a trailer jack would work? Anybody try this yet? It could be easy enough to make the upper yoke adjustable so you could take it right out of the way as I load the barrel.. ? No need to rush - you’ll get a better juice yield if the apples sit in buckets for a couple weeks or so before you press them. When the surface looks a little shrively, that’s a good sign. I’ve seen people use a screw jack with a round wooden foot to squish the apples in a bucket. I suppose you could rig up a lever with a plunger going into the barrel, and then just suspend weights from the end of the lever. Kind of like an old school bottle capper. 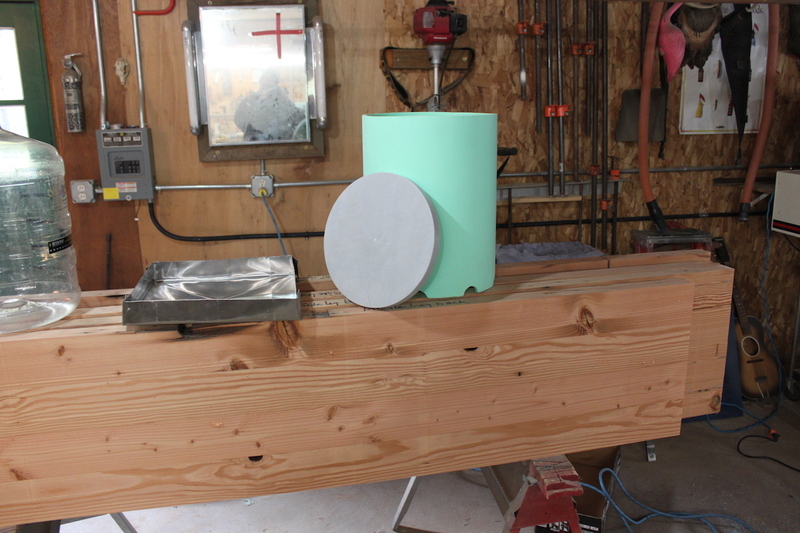 The “foot” on my press is a round piece made of 2” thick maple boards laminated together, with a cross-piece that goes the opposite direction of the other boards, and the screw jack presses on the cross piece. Not sure if that makes sense? I’d take a picture but it’s raining. I made my pan for the press... 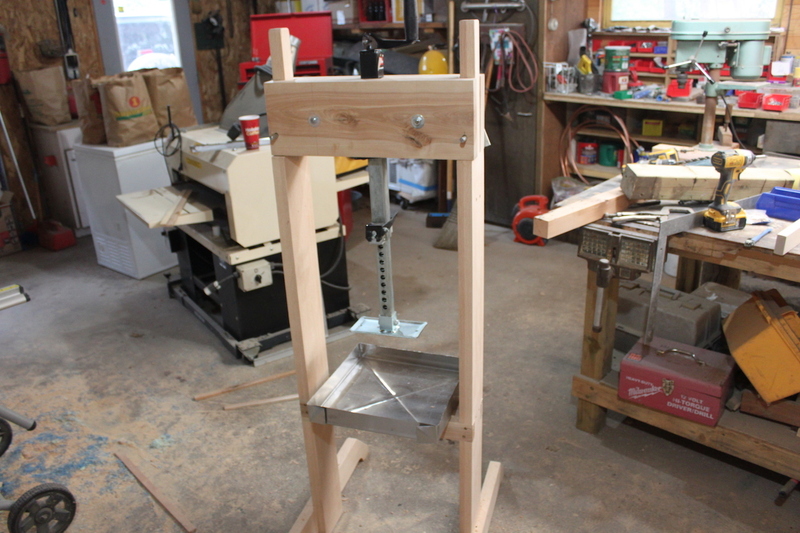 I have all the stuff I need now to construct the press... I'm heading out with a growler of home brew to plot and scheme tonight... Tomorrow will be the build up day... I have like a dozen paper sacks full of apples in the garage...A friend who will bring a 55 gallon barrel full of them over too! I bought a top screw A frame jack.... I'll make the yoke so it can come apart... should I have to replace the jack... Did I mention 19.5" of travel length? Pics of the build, please! What other yeasts do you have lined up? Correct on the rate of campden tabs. Should be fine under an airlock for a few days. How about a gallon of cider left alone, no campden, and letting the wild yeasts ferment? I’ve been wanting to try belle saison in a cider. I don’t think it’ll throw esters, but it produces glycerol which should give it a more full mouthfeel. I’d also go with the ESB yeast for sure. Haven’t tried it.. but I like the idea! I might be concerned about sulfur. Racking through a bit of copper pipe might take care of that, though. Looks awesome! Something to consider with the grinder, mine is attached to the press itself and grinds right into the bucket. Pain in the arse. It would be much better to have it mounted to a separate stand with a different bucket, so that one bucket could be pressed while the other filled. It would make the process go much more smoothly to have two buckets in work at once. I love your design! Holes on the side of the barrel are important because some of the juice will want to go up when pressing and bypass your pressing disk. If you have holes of the side, you won't have that problem. That's the problem I have with my system which I plan to modify at some point. I plan to go bigger with the press at some point which is my bottle neck. My chopper / bucket blender can chop apples a lot faster than I can press. I have a square wooden lattice that the bucket sits on in my pan, that consists of three strips of wood running one way, and a bunch of strips going the other way with about 1/4” spacing between them. This lets the juice run out the bottom and sides. Good call on the paint strainer bags, I have heavy mesh bags that fit the inside of the bucket, but paint strainer bags would probably work about as well.